I really wish Arbok was better than it is. It looks pretty badass by Pokemon standards, with its whole "double face on its body" thing going on. And it's the only generation where its back has cool black racing stripes. But those stats just aren't very good. Above average Attack and Speed and average-or-worse everything else just ain't gonna cut it. Arbok does get some bonus points by learning Glare, which adds ANOTHER pair of eyes into the mix when you use it in the game (especially so in Pokemon Stadium). I always thought it was a cool move, despite the fact it's only accurate 75% of the time. And I suppose you could couple that with Earthquake and Rock Slide and get an okay Physical Sweeper. 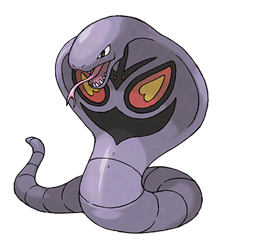 But then you remember that Arbok is a Poison-type, and can easily get taken out by a Ground-type (which it can sort of counter with using Mega Drain), or a Psychic-type (which it can sort of counter by fainting and scurrying back to its Poke Ball). That's too bad for the cobra/basilisk.